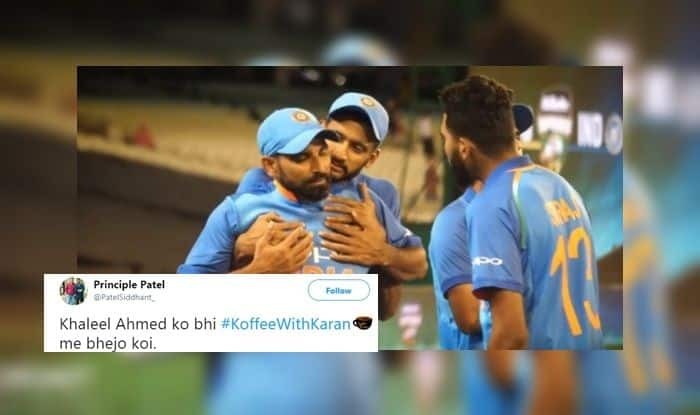 3rd India vs Australia: The pace battery of India Kahleel Ahmed, Mohammed Siraj seemed to be in high spirits after the historic win in the ODI series and decided to play a prank on the more experienced Mohammed Shami. 3rd India vs Australia: The pace battery of India Kahleel Ahmed, Mohammed Siraj seemed to be in high spirits after the historic win in the ODI series and decided to play a prank on the more experienced Mohammed Shami. Shami seemed to be unsure of it and hence was taken by surprise when the two younger fast bowlers surprised Shami. The social media users seemed to find the entire episode extremely hilarious and Shami’s expression seemed to be the reason. Khaleel: Apne video dekha Poonam Pandey ka? Shami: Konsa video, kya hai usme? Earlier, it was Yuzvendra Chahal’s six for 42 that laid the platform for the win. Dhoni bagged the Man of the Series for hitting three half-centuries and for also being the highest run-getter of the series with 193 runs in three knocks. Two of them at Adelaide and MCG came in a winning cause.